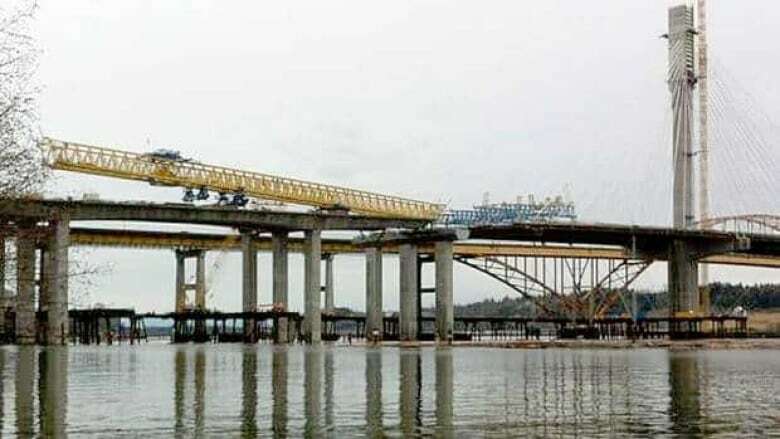 A crane tipped off its tracks on the Port Mann bridge construction project east of Vancouver on Friday morning and dropped a segment of the bridge into the Fraser River. Bridge project spokesman Max Logan said the gantry crane, which is designed to move on rails, is secure and nobody was hurt, but a 90-tonne section of the bridge deck the crane was moving fell into the Fraser River. The segment struck a piling as it fell and is now submerged in the river. It is unclear whether the segment can be recovered. The bridge segments are brought in by barge and lifted into place by the special 720-tonne horizontal gantry crane, which is also called a segment launcher. Logan said one of the supports for the gantry appears to have been crushed and the gantry pitched forward. It is unclear how long the mishap will delay the project, but the contractor Kiewit is responsible for any costs that result. The Trans-Canada Highway remains open on the old Port Mann Bridge and there are no reports of any injuries. When completed, the $800-million bridge will provide 10-lane crossing of the Fraser River for the Trans-Canada Highway east of Vancouver. It is scheduled to be completed in 2013.